As we approach the end of 2009, I think of what a tremendous year this has been here at SysAid. We've launched two major releases - first SysAid 6.0, and most recently SysAid 6.5 - and earlier this year, we released an entirely new product, SysAid CSS for customer service management. We've conducted several successful rounds of the SysAid Certification Program; we've hosted webinars with thousands of SysAiders in attendance; our growing customer base has reached the 55,000 mark. If these developments are any indicator of what's to come in future, then I truly look forward to 2010! In preparation for the new year, this month is the time to learn how you can get the most out of the many features and two brand-new modules of our latest release, SysAid 6.5. As I mentioned previously, one of the most impressive features included in SysAid 6.5 is the new SysAid Chat module. SysAid Chat is completely integrated with the rest of SysAid, and it allows you to maximize all of SysAid's efficient helpdesk processes while providing your end-users with the individual and personalized attention they need. This December, we're happy to provide you with resources that will help you maximize the new capabilities of SysAid Chat. On December 8, you'll be able to participate in another free live webinar, this time dedicated exclusively to the new SysAid Chat module. It's totally free and space is limited, so register now! To get an introduction to SysAid Chat, you can also check out this month's SysAid Chat Product Tutorial. Last but not least, I want to congratulate the record number of SysAiders that are now participating in the SysAid Certification Program! With a special emphasis on the new tools included in SysAid 6.5, this course is essential to gaining the skills necessary for true IT success. Enjoy the holidays and see you next month - or should I say, see you next year! Poll of the Month: Vote for the SysAid Logo for the New Year! 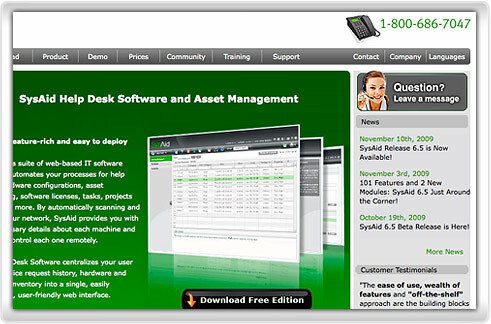 On November 11, 2009, over 900 SysAiders attended the Introduction to SysAid 6.5 Webinar hosted by Oded Moshe, SysAid Director of Product Management. With explanations and live demonstrations of the many new features SysAid 6.5 has to offer, this webinar provided attendees with important insights into how you can improve your IT performance with SysAid's latest release. If you missed it - or want to hear it again - you can still learn all about SysAid 6.5 in the online recording of the webinar. For the new SysAid 6.5 release, we specially designed a new communication channel to help you effectively balance your end-users' needs with the requirements of your IT helpdesk. With the exciting SysAid Chat module, your end-users enjoy all the perks of real-time communication while you continue to maximize the automated processes of SysAid's helpdesk. So what's so special about the SysAid Chat module? It's completely integrated with the rest of SysAid. With SysAid Chat, you can view the end-user's entire service history from within the chat conversation: which service is being discussed, where the user is located, and all other opened and closed service requests that the end-user has submitted. As you chat with the end-user, you can change or close the service request, or create a new one and easily attach the asset connected to the end-user. All chat conversations are saved within the service request for administrators to refer to at another time. It's an incredible time-saver. When you communicate by email, you need to wait for your end-user to respond, and it often takes several emails to finally close the service request. Phone conversations are also lengthy and allow you to focus on only one end-user at a time. With SysAid Chat, you can manage several end-users at once in real-time. You can view queues of end-users that have initiated chats, transfer chat conversations to other predefined queues, and rely on visual indictors to show you when end-users have replied and are waiting for a response. With the end-users live on the other end, you can close service requests more quickly and efficiently. It allows you to provide your end-users with better service quality. End-users can initiate chat conversations via the End-User Portal to get the quick response they need when confronted with a technical issue. They feel that they're receiving individualized attention and better appreciate the efforts of your IT department. Getting immediate and personalized help beats automatic notifications every time! It's included for free in every Edition of SysAid. In other products, helpdesk chat capabilities are usually designed for external users and cost hundreds of dollars a month. With SysAid, innovative chat capabilities are included as part of the basic package! As an additional tool to help you promote your SysAid Internal Campaign, the SysAid Chat module encourages your end-users to turn to SysAid when they need to report a technical issue. To see how SysAid Chat works in action, check out this month's SysAid Flash Tutorial: Working with SysAid Chat. There's also a new SysAid Chat Forum on the SysAid Community - check it out to see what our experts and other SysAiders have to say about improving communication with your end-users! On December 8, Director of Product Management Oded Moshe will be holding a free live webinar that specifically focuses on the new capabilities of SysAid Chat. Register now and see how SysAid Chat can help you establish best communication practices in your IT department! IT professionals worldwide aren't the only ones benefitting from the new SysAid Chat module. Here at SysAid, our support team is also taking advantage of SysAid Chat to provide better service for our customers. Itay Hayat from the SysAid support team tells us how SysAid Chat has changed the way he provides technical support. "Before SysAid Chat, we chatted with our customers via various third-party chat tools. Those programs weren't convenient to work with when trying to resolve service requests," says Itay. "To effectively resolve a service request, I need to have access to the customer's entire service history and see information about the customer's assets. With other chat tools, I had to go back and forth between the program and SysAid to find this information and diagnose the problem. I often had to ask customers to submit a service request. When people are experiencing technical issues, they don't want to have to wait." With the release of SysAid 6.5, Itay and the rest of the SysAid support team now use the new SysAid Chat module to resolve service requests with customers in real-time. "The SysAid Chat module gives me an entirely new and improved set of support tools. It's completely integrated with the rest of SysAid, and it makes our work so much easier. Within the Chat Console, you can see the customer's entire service history, where they're located, and you can open new service requests from within the conversation. I can see a queue of all the customers I'm chatting with, and it takes no effort to see who has responded when. That allows me to provide our customers with a better service experience." The other day, Itay was contacted by a SysAid customer who wanted to know how he could back up his Derby Database. The issue was a relatively simple one, and Itay knew that chatting with this customer would be the fastest and most efficient way to help him. Itay was able to quickly explain to the customer how to back up his database. While waiting for the backup, they talked for a few seconds about football and the places Itay had visited in Brazil. Itay then closed the service request. "Because backing up a database is relatively simple, it was great that I could close it so quickly and move on to bigger issues. SysAid Chat is really helpful when we need to deal with urgent cases. If someone's server is down, I can open a service request immediately, get the information I need from him, and shorten the total resolution time. In that way, SysAid Chat really reduces our workload." To see how you can maximize the new capabilities of SysAid Chat, join us on December 8 for another free live Webinar that will focus specifically on establishing best IT communication practices! As you browse through the different forums of the SysAid Community, you can't miss the many contributions of SysAid Pathfinder and IT enthusiast Lev Tinkelman. For Lev, IT is not just something he does on the job at Gadot Biochemical Industries; it's a passion that drives him to tinker with the computers of both friends and family during his time off. As the Community Moderator of the Asset Management forum in the SysAid Community, Lev's commitment to IT excellence enriches the quality of resources available to SysAiders worldwide. His newest hobby, however, extends beyond the world of technology - he's now busy taking care of his newborn baby Emily! Q. How long have you been with Gadot and what is your role? A. I've been working at Gadot for almost three years. In addition to running the helpdesk, I do everything from installing hardware and cable to dealing with VMware and telephony. Q. When and how did you first discover SysAid? A. We were looking for a friendlier solution for the inventory of our hardware and software assets, and a SysAid distributor introduced us to SysAid. It's a great solution and we have been using it ever since. Q. How does SysAid help you overcome your day-to-day IT challenges? A. Our plant operates 24 hours a day, 7 days a week, 365 days a year. Any problems that affect production processes need to be resolved as quickly as possible, and SysAid keeps us notified via email or SMS day and night. Furthermore, SysAid helps us see what assets we have and what software and hardware is installed on it. The SNMP tool is particularly helpful for our inventory processes and with SysAid 6.5, we can monitor our SNMP values with the click of a button. Q. As an active SysAid Pathfinder, what motivates you to participate in the Beta testing process? A. I like SysAid and the change it has made in my organization. SysAid is a great product, and I think that my participation in the Beta testing process helps contribute to the future of a steady and helpful solution that meets the needs of SysAiders worldwide. I enjoy bringing change and contributing to the wealth of the SysAid Community. Q. What features and modules in our newest release, SysAid 6.5, do you find most helpful? A. I think that the "Reminders" feature is one of the best. When I update my software, SysAid will now let me know when it's time to renew the license again. The best module? Tricky question. All of SysAid's modules are great, so it's hard to choose! Q. Which forums on the SysAid Community do you visit the most often? A. I visit the Helpdesk and Asset Management forums, but the best forum is Beta Issues. That's where all the action is! Q. How can other SysAiders benefit from referring to and participating in the Community? A. On the Community, SysAiders can find help, solutions, and workarounds for their problems. The Feature Request forum is a place that can make SysAid better for everyone - as IT professionals, we know what we need! When everyone shares problems and solutions, the whole SysAid Community can benefit. Q. What inspires you to work in IT? A. My biggest inspirations are seeing how grateful users are when their issues are resolved as well as gaining a wide breadth of IT knowledge. I like computers, and I like providing service. A. I'm a family man and I enjoy nature and playing billiards. I have a new hobby now which makes me really happy - my newborn daughter Emily. This month's SysAid Chat Tutorial shows you how the new SysAid Chat module can help you provide an excellent support experience for your end-users. 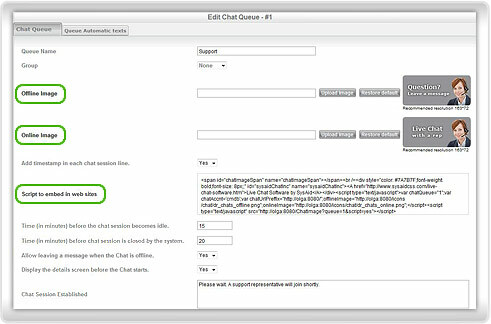 Learn how you can use SysAid Chat's integrated functionalities to access an end-user's service request and entire service history from within the chat conversation. With instant access to the end-user's asset information, you can diagnose and resolve the end-user's technical issue in real time - and improve your quality of service. Check out the previous SysAid Flash Tutorials to learn about other SysAid functionalities, and stay tuned for next month! We in the SysAid support team have been using online chat as a communication channel for years, but now that we've implemented the new SysAid Chat module, we've benefited from an entirely new set of features and capabilities. SysAid Chat is an easy and intuitive way to communicate with end-users, and it gives you all the information and tools you need to provide high-quality service in one place. To encourage your end-users to contact you via SysAid Chat, I recommend that you make SysAid Chat available in web pages outside of the End-User Portal. Following a few simple steps, you can embed a customized chat icon anywhere you want in any website's interface - even your external website - as seen below. Go to Preferences --> Chat Settings --> Chat Queue. If you have more than one queue, select the one you would like to make available in the website. Find the "Script to embed in websites" box. Copy the script. In the webpage, paste the script where you would like it to appear. With the script we provide, the default SysAid Chat icon will appear on the website. You can easily upload your own customized images by choosing "Offline Image" and "Online Image." In the SysAid spirit of "IT's that Simple," it now really is that simple to communicate in the world of IT! Vote for the SysAid Logo for the New Year! You may have noticed that from time to time, we modify the SysAid logo to pay tribute to holidays celebrated throughout the world. Never paid attention? As the beginning of 2010 approaches, you have the opportunity to vote on which logo you'd like to see for a full 24 hours on January 1! While SysAiders remain divided on the merits of Microsoft's latest release, the majority vote in favor of Windows 7. 43% report that they can't wait to replace Vista (if they haven't already) and another 37% have plans to ultimately upgrade to Windows 7 in the future. A conservative 15% remain loyal to the tried-and-true XP, and only 2% believe that Windows 7 will be a flop. The debate over Windows 7 continues... until the next Microsoft release, that is!